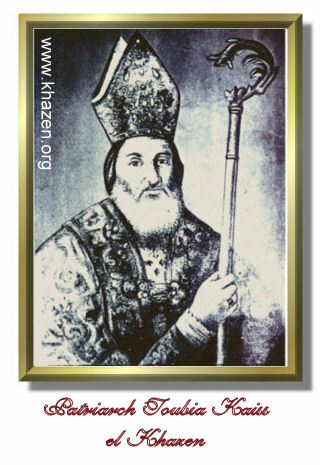 Here is a short biography of another great from El Khazen's family who became Maronite Patriarch between 1756 and 1766. We will present in Part1 his early life and how he was elected Maronite Patriarch of Antioch before tackling his main achievements and the major incidents and events that occured during his 10-year rule. Sir Toubia El Khazen, son of Abi Kanaan Kaiss El Khazen, was serving as bishop of Palestinian city Nablus as of 1733. He later was appointed as bishop of Tripoli and then Cyprus. During his stay in Cyprus, he was the sole representative of the Maronite Church and the Patriarchal seat in Qannoubine. As a result of their meeting, Bishop Toubia El Khazen was elected as the new Maronite Patriarch of Antioch on the 28th of February. Following his election, Toubia El Khazen appointed Bishop Arsanius Al Halabi as his representative and sent him to Rome to gain recognition and blessing from the Vatican and its head pope Benedictus XIV. The letter was dispatched on the 20th of March 1756. I, your humble servant Tobia El Khazen, previous bishop of Cyprus and newly elected Patriarch of Antioch for the Maronite, bow to you respectfully and kiss your feet and cordially inform your holiness that Patriarch Semaan Awwad has passed away and we have conducted the habitual rituals and prayers for the rest of his soul. Due to his unfortunate death, my brothers and I met on the 28th of February in St Joseph school in Aintoura, and abiding by the laws and regulations of our Maronite church and the Catholic Church, elected yours truthfully as the new Maronite Patriarch, even if I find myself not worthy of such honor. As it has been the tradition for hundreds of years, we found that it is our most sacred duty to inform your beatitude and holiness of the outcome of those elections and seek your blessing, as you are St.Peter’s successor who was told by Jesus to take care of his herd and bless his brothers in faith. For this reason and more, I bow to you and solicit you to bless and recognize this election as such has been the tradition with my predecessors. Also, I ask your holiness to grant us the sacred shield and dispatch it with my messenger and brother Bishop Arsanius Al Halabi whom I’ve sent on my behalf given the difficulty of travelling and length of distance. In this letter dispatched to your beatitude, I present myself as a loyal follower and servant of the Holy Catholic Church, and bow to serve the papal church and obey its fatherly advice, as well as God the savior and all the saints. I also promise to remain loyal to the church throughout my whole life, and abide by its divine decisions." Here is another excerpt from a speech by the Pope Benedictus XIV upon his recognition of Patriarch Tobia Boutros El Khazen. This being said, Pope Benedictus XIV recognized the election of Maronite Patriarch Tobia Boutros El Khazen and granted him the roman pallium as a sign of appreciation and gratitude, along with the apostolic and fatherly blessing.